Sarah Beth Durst’s The Queens of Renthia introduced readers to a world where nature and humankind coexist in a state of precarious balance. While life would cease to exist without the presence of the natural spirits, they also see humans as the invaders of their domain and would gladly see us all dead. If not for the protective powers of a Queen who holds control over all the spirits in the area, human settlements would be under constant threat of vicious attacks. But that trilogy only focused on a very narrow slice of the world—the forests of Aratay, to be exact. And if you were anything like me, you probably also asked yourself the same questions after reading: is it like this everywhere else? And if there are forest spirits, does that mean there are also desert spirits, grassland spirits, ocean spirits? Some of these answers, in part, can be found in The Deepest Blue, something of a spin-off off the original series. It can be read as a stand-alone, as this time, our focus is on a whole new set of characters. The novel transports us to the crystal blue shores of the island nation of Belene, home to our protagonist Mayara, a young woman about to be wed to her best friend and love of her life, Kelo. Surrounded by friends and family, she can hardly wait for the big day. Her only regret is that her older sister would not be there to witness her happiness, Elorna having perished in an accident eight years ago, while diving for shellfish. The family has never been the same since. Understanding better than most how dangerous the island and its surrounding waters can be, Mayara vows she would never take the love she and Kelo shares for granted, that they would make the most out of their new lives together. However, that future may be snatched away before it has even begun. On the day of their wedding, a deadly storm sweeps through Belene, destroying homes and taking lives. Such a powerful destructive force could only have been caused by the ocean spirits, and Mayara fears she may be the reason for their sudden attack, for she has been hiding a secret, one known only to a very few. But now that most of Belene is destroyed and so many close to her are dead, she has no choice but to finally reveal it: she has the power to control the spirits. To save those she loves, Mayara must make a difficult choice—sacrifice herself and be sent to a lonely island where others like her tested, or spend a life on the run so that the spirits and their watchers, the Silent Ones, will never find her. For those who have read The Queen of Blood, The Deepest Blue mirrors it in some ways. Both are about reluctant protagonists who come into their power to control spirits and must compete with other young women to become Queen. But the way things are on the islands is very different from the forests. Mayara finds herself in a fight for life, as only one woman can become Heir while the rest of them must die—a situation that is much bloodier and cutthroat than we are used to. In this sense, the comparisons in the synopsis to The Hunger Games are warranted, in terms of action, violence, and brutality. Mayara, however, is a very different kind of heroine from a lot of these stories. As the last to arrive on the island, she has also received the least training. Knowing that her chances of survival are low, she decides on another tactic, reaching out to the competition in the hopes of making friends and allies. Consequently, The Deepest Blue became less about a tale of individual survival, instead transforming into one of sisterhood and cooperation against the elements. I was also pleasantly surprised by the inclusion of Kelo’s perspective. I don’t want to elaborate too much on his role for fear of spoiling the plot, but I did like how the romance in this book eschewed conventions by focusing on an already established relationship between a newlywed couple. There was also more complexity to this story than I expected. Threads of political machinations and mystery are woven throughout, adding more intrigue to the premise. The ways of the islands are fascinating, and I loved that Durst expanded on the magic, spirits, and cultures of her world by taking us to this whole new setting. As much as I enjoyed the original trilogy set in the forests, there’s just something so alluring about Belene and its tropical islands and oceans, and the fact that this is the backdrop to so much vicious scheming and violence simply intensifies the suspense. All told, The Deepest Blue was a most welcome addition to the world of Queens of Renthia, and I’m also thrilled because this book made me realize I was not quite ready to say goodbye to all the magic yet. Fans of the trilogy will be sure to love this one too, and while I highly recommend starting out with those books first, new readers can also jump right in and enjoy it on its own. And now time for the giveaway! Since I enjoyed The Deepest Blue so much, I want to share the love with a copy I’m putting up for giveaway. With apologies to our international readers, due to the costs of shipping, this giveaway is open to residents of the US only. One winner will receive a hardcover copy of the book. 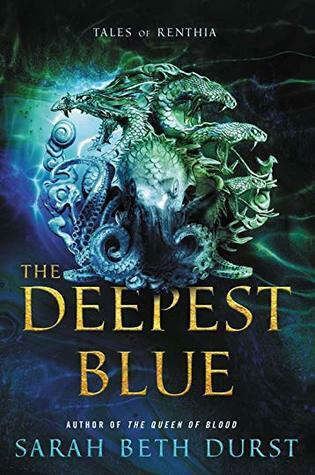 To enter, all you have to do is send an email to bibliosanctum@gmail.com with your Name and valid Mailing Address using the subject line “THE DEEPEST BLUE” by 11:59pm Eastern time on Monday, April 8, 2019. Only one entry per household, please. The winner will be randomly selected when the giveaway ends and then be notified by email. All information will only be used for the purposes of contacting the winner and sending them their prize. Once the giveaway ends all entry emails will be deleted. Yess sun i want sun! Yes, I am in awe of that cover. So pretty! This does sound good and I would like to read it but I need to finish the other series first. Yeah, while this can be read on its own, if I were you I’d probably hit up the original trilogy first too if I could help it – it’s a great series! It would be so hard to resist that cover and it’s great that you liked it so much as well. I might have to look into these. Yeah, I am in love with that cover! It’s perfect for the tone of the book too. Sarah Beth Durst is one of those authors on my “must read one day” list. Glad you loved this! While aware of this series (one of my “must read one of these days” many titles), I still have to start reading it, and I must confess that the seashore location for this one sounds much more fascinating than the forest ambience of its predecessors – probably because I love the sea so much… It’s good to know I might be able to jump into the series from here, and your description of story and characters is a powerful enticement. Durst has been on my radar for a while, since the Renthia books look so dang good. And the sound of a tropical island setting, with the ocean spirits and all, definitely has me chomping at the bit for this! Indeed, I was so excited when I learned she was going to be returning to the world of Renthia – and taking us to the tropical islands to boot. I wonder if she’ll write more set in the islands, or if she’ll be exploring another part of the world next. Oh my gosh, that cover!! Glad to hear this was a hit for you! This one made me realise I need to read Renthia! Oooh. And this one works for my bingo challenge, if only I weren’t doing all Vampire related books…. lol. This looks great! I really want to read some of her stuff soon too.